In this installment I’m going to take a look at what the big web portals have to offer. But first I want to review how returns are calculated and what you should be looking for from those numbers. There’s a lot of ways to calculate your returns, but unfortunately all these web sites use the simplest of methods: Total Return. Basically, they compare the ratio of your gains (or losses) to your costs without taking time into account. This is fine if you bought all your investments in one shot (at least on the same day) and now you’re going to sit back and watch them. In reality you want to know your annualized return. Which is a fancy way to say you want to your average annual return. Except it’s not as easy as dividing the Total Return by the number of years you’re invested (that would be the simple or arithmetic average – and it’s the wrong way to annualize your returns). A better way would be to calculate your geometric average or compound return. But there are even better ways: Money-Weighted or Internal Rate of Return, Time-Weighted or Linked Internal Rate of Return, Modified Dietz Rate of Return, or the Daily Valuation Method. The best would be the Daily Valuation Method, but unless you have a super-computer you won’t be calculating this one. Of all these probably the best compromise between efficiency and accuracy is the Modified Dietz Method (also known as Approximate Time-Weighted Rate of Return). Once you’ve calculated that for each period (monthly, quarterly, or annually) you can link it together geometrically to see your annualized return over the years. Once you know your annualized rate of return you can properly compare your investments and see which ones really are doing well, and which ones just sound good. For more details on the calculations, PWL Capital has a great white paper on on How to Calculate your Portfolio’s Rate of Return. Now hopefully one of these web sites, at least the ones that track dividends, take all that information to calculate a proper annualized rate of return. These are the big internet sites where a lot of us start our day. They bring a lot together, like news and weather, functionality like web searches, e-mail and calendars, and more. Adding a portfolio to that isn’t a stretch but since it’s not their focus we might not expect anything exciting from them, but we hope that with everything else going there’s going to be some interesting integration – like easy searches, e-mail alerts, and social sharing. They nailed the user experience with a clean and simple design that puts more data onto one page than any other site, and there’s even a gadget for my iGoogle home page and functions for my Google DocsDrive Spreadsheets. The charts are perfection: I could configure my own default settings and with one click I could expand the chart to the full width of my screen. But they blew it on data since dividend information for Canadian stocks (ETF’s in particular) is sometimes missing, in-complete, or just plain wrong! They have one of the nicest portfolios – it’s actually a Silverlight app so it better be slick! But the rest is held together with duct tape and bubble gum. And basic information for Canadian stocks – even blue chip stocks – is frequently missing. The initially beautiful web site falls apart just below surface. This is what you’d expect from a web-base portfolio. It looks nice, but the functionality is pretty basic and regrettably dividend information is often missing for Canadian stocks and the news is U.S. focused. Since Yahoo has fallen on hard times they’re probably not putting a lot of effort into something you can get everywhere else, so unfortunately I have to recommend you go somewhere else! In the next installment I’ll take a look at what the news outlets have to offer. While some are astounding there are a few stinkers in the bunch! Disclaimer The material on this website does not constitute advice and you should not rely on any material in this website to make any decision or take any action. Whether it’s just the curiousity for your favourite companies or fantasizing about what you’d do if you were Warren Buffet, or monitoring your RRSP, TFSA, and children’s RESP having an on-line portfolio manager for your investments is fun and convenient. Probably one of the best reasons to have your investments in a web-based portfolio manager is to avoid having to login – and stay logged in – to your brokerage whenever you want to see how things are going. And if your brokerage is also your bank and credit card issuer then it’s really not something you want to leave open on your computer all day! Besides, most of us automatically log in in to a portal (Google, MSN, or Yahoo) or news site (Globe & Mail, National Post, etc.) anyways so we may as well take advantage of their portfolio managers at the same time. One thing is certain, there’s a lot of differences amongst all the portfolio managers out there on the web! Not only do they look different, but they offer different functionality – some focus on quotes, some on charts, and some on analysis – and varying amounts of information (and completeness of the information). 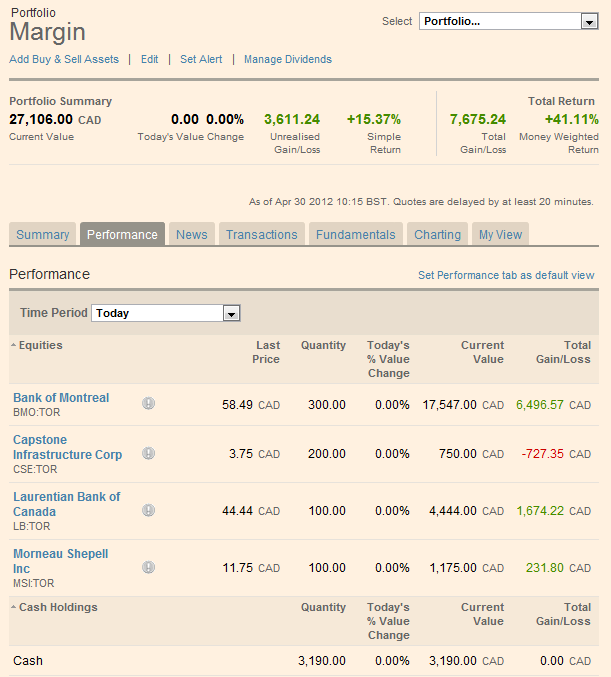 I’ve compared portfolio managers from the portal sites: Google, MSN, and Yahoo; the news sites: Bloomberg, Canadian Business, Financial Post, Financial Times, Globe and Mail Investor, and MarketWatch; financial services: Barchart, Morningstar, and TMX Money; brokerages: Bank of Montreal Investorline, Qtrade, and Royal Bank of Canada Direct Investing. You can see screen shots of a sample portfolio, quote, and chart from each one in the gallery. the user experience: if I felt like I was back in 1995 and using Netscape Navigator rather than a modern browser on a modern web site then the portfolio manager got a thumbs down! 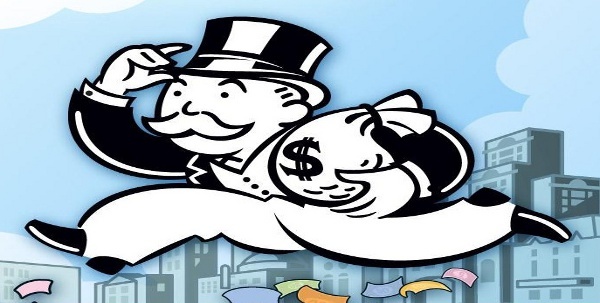 completeness of the data, especially dividends: investing for dividends is one of my primary methods and the more a web site tells me about the dividends the happier I am! charts: I like my charts to cover 3 to 5 years, show Bollinger Bands, and dividend payments – AND I want all that in as few clicks as possible! Everyone looks for something different, of course news, analyst opinions, financials tables, and more are all available to varying degrees. I would also like to see a portfolio manager that goes beyond the generic performance calculations and puts something together not only for my portfolio but that also takes the dividends my investments generate into account. It’s easy to calculate total return and other metrics based on your cost and the current market value. It’s harder to take cash flows and time into account but I’d really like to see a web site that did that. One thing I don’t like to see is a lot of advertising. I realise it’s inevitable these days but some web sites do a better job of integrating the ads and on others it is far to distracting to make the web site usable. Yodlee since their portfolio manager is barely ready for alpha let a lone general use! And I’m sure there others out there too that I missed, and I’d be happy to hear about them in the comments. In the next installment I’ll look at the what the portals have to offer. I recently went through the exercise of finding a replacement for Instagram, when they sold-out to Facebook. Path wasn’t on my list of replacements at the time because they didn’t offer filters or lenses like Instagram does – at least on Android, iOS users have had that feature for some time. Now that Path has added that feature to Android, and because quite a few friends switched to Path after abandoning Instagram, I have given it another look. The coolest feature of their lenses is they are applied while you are taking the picture! Not afterwards, so you can see live how the shot will look. You can always change the lens afterwards too. Unfortunately Path doesn’t have all the editing features I’ve gotten used to now in Aviary – things like cropping the photo, rebalancing the colours, adding some mark-up, and more. And their lenses do not include the funky borders or other embellishments that Aviary (and Instagram) added to accentuate the effect. 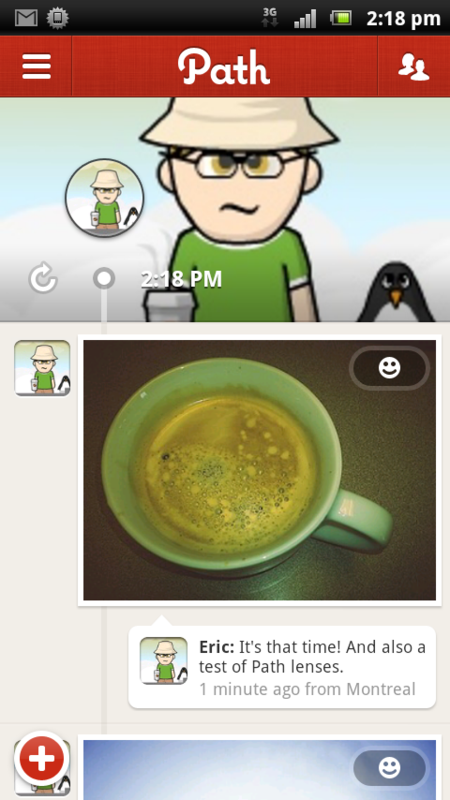 So the question is, do I use Path as a Twitter client? Do I abandon Twitter (and it’s ecosystem) and live entirely on Path? Or is Path just not happening for me? I don’t really have any compelling reason to be on Twitter over any other social network – I’m following a couple dozen people and the ones I interact most with I also see in-person or are on Path too. But my current workflow (snap a photo, edit & embellish with Aviary, and post to Twitter with hosting on TwitPic) works really well. Photos posted to Path and shared on Twitter are only visible if the viewer clicks through the tweet to Path (photos shared on Tumblr show-up on Tumblr but you have click through to Path to see the comment) – TwitPic photos show-up in the tweet. For now at least, stay tuned to Twitter rather than Path. Lately I’ve been trying to finish all the little projects I’ve started around the house. Recently, I finished the central vacuum project. 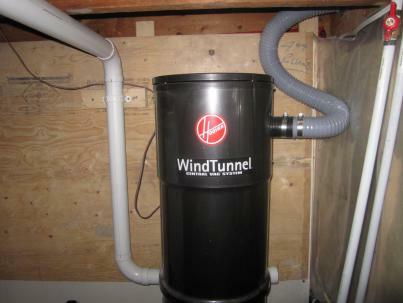 We’ve been using it for a couple years now, and a central vacuum is great! There’s only the hose and want to carry around so it’s super light; the motor unit is in the basement so there’s hardly any noise; and it exhausts outside so there’s no filter or any fine particles blown around the house. Rule #1: Work with gravity – not against it! It might seem like a good idea to start in the basement, where you can make a mess without worrying about cleaning-up right away, but it’s much easier to line-up your holes when letting a five-foot drill extension hang downwards than when trying to hold it upright above your head! The less bends and splits the better. If you’re house has two levels try to keep it vertical; if it’s a bungalow keep the outlets in a straight line. Figure out where your outlets are going to go. This depends a lot on how long the hose is that you have. Make sure you can comfortably reach all around your house, under the beds, around furniture, and up to the tops of bookcases and armoires (with the duster attachment). If your walls aren’t aligned and you would have to make an odd bend in the pipes see if you can up or through a closet instead, where no one will see your “short-cut” and you’ll avoid unnecessary work. The main unit needs to be solidly mounted but remain accessible so you can empty the canister regularly. Make sure there is enough clearance above and below the unit. It should also be near an outside wall so you can exhaust to the outside (if you decide to, but doing so means the small particles that pass through the filter end up outside). There’s a muffler too you can put along the exhaust to keep the noise level down. There also needs to be a power outlet nearby to plug the unit into. Dry fit all your connections before gluing them together – you’ve only got one chance and if you get it wrong you’re headed back to the hardware store for more pieces! Note that the tubes should have a dashed line down the side and the fittings should have eight notches around the edge. Line up the dashed line with one of the notches and mark them both with the marker. 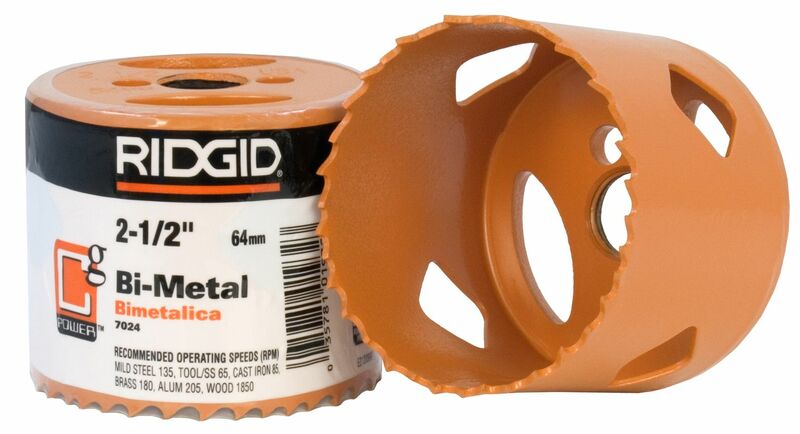 When cutting the tube use the mitre box and hack saw to make nice, straight cuts. Then de-burr the edge so it’s nice and clean. Once everything is fitted you can start gluing. Make sure you can still move the pieces around enough to glue the next piece on, not so the system is so rigid. It may be better to work towards the middle rather than towards one end. Don’t forget to pull the 18-2 control wire along with the pipe and attach it to the outlets as you go. And once it’s all glued together, or even as you’re gluing if necessary, don’t forget to put in some straps to hold the tubes in place. 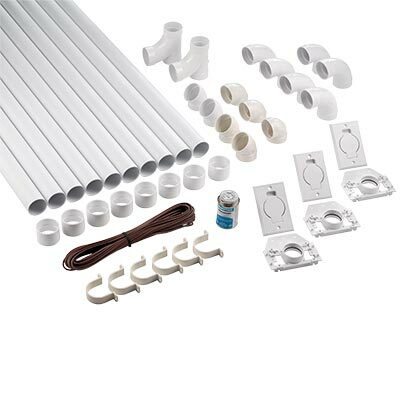 Either the pipe straps when the tubes are up against a solid surface or with a length of metal strapping when the tubes are hanging (make sure you wrap around the tube for a solid hold rather than just passing underneath the tube). If you’re installing a sweep inlet be aware they’re not easy to do. Not only because they’re typically in awkward places but because the fitting snaps onto the back without glue you have to make sure you don’t dislodge it when you connect to the rest of the tubes. Along the way you might want to use some duct tape on a few key joints in case you need to make any changes later. Or if you can’t finish the whole job in one go but still need to use the system. Now that the system is installed you can kick back, crack open a cold one, and compare your work to my installation. Ever since the bombshell dropped, that Instagram had sold out to Facebook, a lot of us have been looking for an alternative. Now the sell-out may not be the end of the world as we know it, but we expect in a very short time that Instagram will change their terms of service to read All yur pics iz mine! and we’ll be forced to share on Facebook primarily. That may not happen. Facebook might simply embed Instagram as the built-in camera on their smartphone apps and leave the rest of us who don’t Facebook to use a stand-alone Instagram like we do now. But is that really why they invested a billion dollars to acquire Instagram!? Some of the alternatives that have been mentioned include: Aviary, Flickr, Hipster, Lightbox, Magic Hour, MOLOME, PicPlz, Pixlr-o-matic, Poctos, and StreamZoo. A search on the Google Play store for “photo filters” or even just the Photography category reveals more than 1,000 results! Granted they aren’t all Instagram-like apps, but reading through the first few pages reveals that there are a lot of choices. More than we can possible review here, sorry. 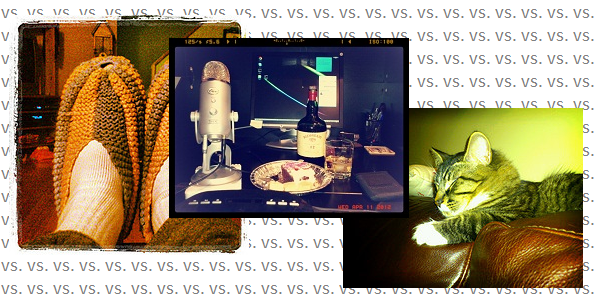 So for your consideration, here are some alternatives to Instagram. Not an exhaustive list, but the list I am considering. They aren’t all drop-in replacements for Instagram, but the ultimate result is the same: sharing fun, quirky photos. 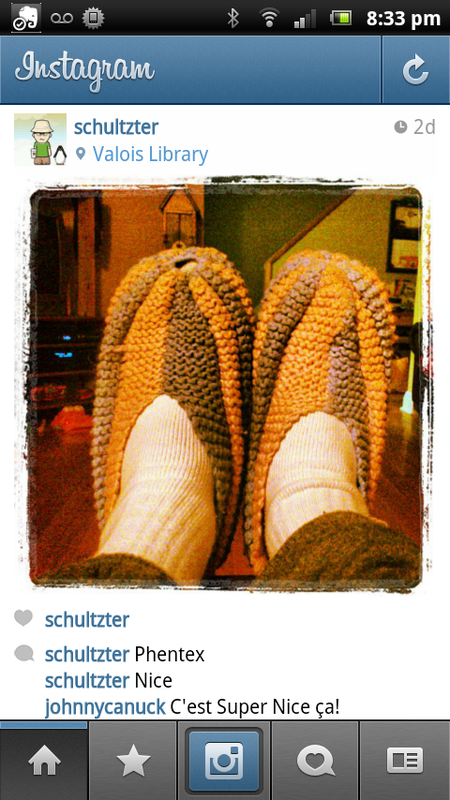 This was the first Instagram-on-Android app that I tried. It worked really well, and pretty much works like Instagram. The most interesting twist for Lightbox is the camera is interchangeable, so if you prefer another camera app you drop that in, or you can use Lightbox’s camera independently of Lightbox. This is what I first switched to after the sell-out announcement. It too works pretty much like Instagram, in fact pre-dating Instagram in it’s creation. The interface is not as intuitive though – it sounds simple enough: one touch effects. But you end up with a long list of combinations when in fact having a few separate toggles and lists would probably be faster. The coolest thing about PicPlz is that it integrates the Aviary tools so you can go beyond effects and actually edit your photos on your phone. This one actually sounds cooler than Instagram and represents something I’ve done on family vacations: I use my phone to send personalized, custom e-mail post-cards. The Hipster app takes this simple idea, builds-in a camera, filters & effects, and makes an entire community out of it. You can flip your post cards over and see more information about the photo. Perhaps not one you’d expected to see in this list, the Flickr app actually works perfectly as an Instagram replacement – it even has a built-in camera to go with the filters & effects and sharing. And it has the added benefit of the power of Flickr once you’re back at your computer. So everything you share ends-up in your Flickr account, the same place you share the photos you take with that hefty DSLR – no integrating multiple sites into your workflow or directing your followers all over the intertubes. This is another odd member in the list. Aviary revolutionized online media editing (not just photos) and has a suite of tools anyone can integrate into their apps (either mobile or web based). But this isn’t an app, in fact this is a sharing plug-in that allows you to add filters & effects (and a whole lot more) to your photos before the final step of sharing them via your favourite service (ex. : TwitPic for Twitter). Even though Aviary is free, there are add-ons (filters, lenses, stickers, etc.) available for purchase. This is the big-daddy of filters and effects. There are so many it would overwhelming, but they’ve thoughtfully included an effects manager so you can decide which ones show up as your initial choices. Obviously the coolest thing about Pixlr how much you can do with your photos (84 effects, 287 overlays, and 193 borders), and their interface is solid and well thought-out so it doesn’t have be overwhelming. This is app will have you playing with the same photo for hours if you’re perfectionist. Especially from Google, that has PicasaWeb, I would have expected something like the Flickr app. Between Google+, PicasaWeb, Google Docs, Blogger, and the upcoming GDrive they offer at least four ways to store and share your photos. But the mobile experience is horrid (PicasaWeb synchronization is either all or nothing, Google+ auto-uploading is unreliable, third-parties filling the gap aren’t really an integrated solution). And Apple too, known for their outstanding media software, should be leading the way rather than leaving the way for others to build a billion-dollar enterprise! After trying all the aforementioned apps on my phone, a few more in an emulator, and visiting a few web sites (but the apps didn’t make the cut) I can say one thing for sure: there are a lot of choices! My current, likely final, solution is using my built-in camera and embellishing the shots I want to share on Twitter (via TwitPic) using Aviary. The Aviary tools are very powerful, though typically I’ll just crop and add a filter, if I need to there’s a lot more I can do. And I’m really tempted to buy the Viewfinder effects. The other thing I’m adding to my workflow, that I discovered while researching this article is QuickPic. This replaces the default gallery and makes working with the photos (and videos) on my photo much easier, including opening them in Aviary and sharing them. This house is getting a cellular antenna, originally uploaded by schultzter. Sleeping kitty, originally uploaded by schultzter. We’ve all seen the cool retro pictures on Twitter (and elsewhere) generated by Instragram. And it’s fun to play with the filters when sharing some nonsense on Twitter, and seeing the effect immediately appear on the screen. There are other apps that do this but Instagram definitely makes it quick and fun to do. So far my only annoyance is not being able to set a default or favourite effect as a starting point. In fact, Instagram has worked really well. It definitely appears they’ve taken the Android platform to heart. There haven even been a number of fixes and improvements in the first week, which is very impressive. It’s been a week, I took a few pictures and published some of them. I definitely won’t take the awesome camera on my Xperia (is it a phone with a built-in camera or a camera with a built-in phone?) and make the pictures look like I was still using my Xenon all the time. But for the stuff I typically share on Twitter this will probably be my go-to app, replacing TwitPic (though TwitPic’s web interface has some value – it would be nice if we could see our history of Instagrams via a web interface, or if they were automagically tagged on Twitter). For years now the clinic I go to has been telling people when it will be their turn, and asking them to show up 30-minutes before. It works, it’s free, and doesn’t rely on any technology. There’s never more than a half-dozen people in their small waiting area. And they’ve been able to use the extra space for professional services (that aren’t covered by Healthcare). But if even that’s too long a wait for you, try calling 8-1-1, consulting your pharmacist, or going to a CLSC. Just don’t whine about lack of government funding and then whine about all the taxes we pay! Where do you think the government funding comes from!